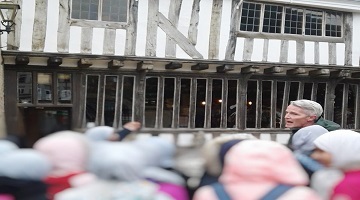 Year 7 explored local medieval history during their recent visit to the historic quarters of Leicester. Year 7 followed a trail with a guide from Historic England, visiting the Leicester Cathedral, which has evidence of being one of the first religious buildings in Leicester. Thereafter, they visited the Guildhall museum – the hall of medieval council meetings, Wygston House and finished the afternoon at King Richard III Museum, where students explored how archaeology and cutting edge science have been used to unravel the discovery of the grave of the final medieval monarch of England – King Richard III.